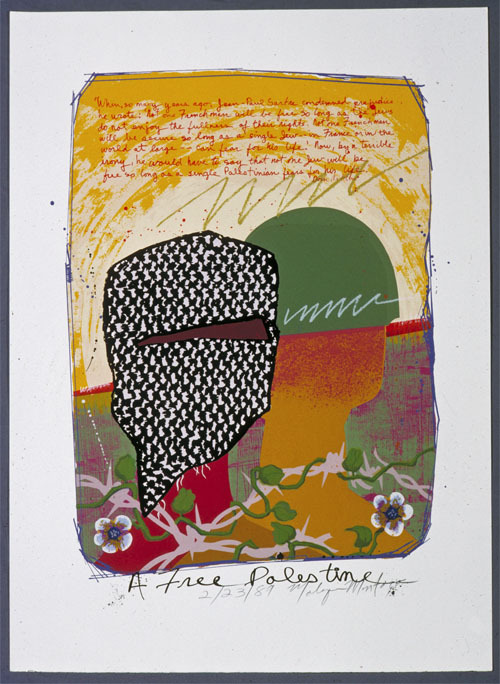 In the land declared on November 15th (1988) to be the Palestine nation, all reference to that nation in song, print or picture is banned by the Israeli government. It is a crime to display its flag, and cause for suspicion to dress oneself in its colors. In Ramallah or Hebron, the images we have created for this show would be torn down from the walls. Even in the United States, our exhibit will lead a somewhat subterranean existence. The issues it raises are still taboo. Its simple affirmation of Palestinian identity will be felt as concealing a threat to the existence of the Jewish state. In the conflict between Israel and Palestinians, the assertion of one identity has been portrayed as inevitably entailing the denial of the other. And yet the opposite is true. Hope lies only in mutual recognition. Our show honors Palestinians’ struggle to become visible in their own right. We celebrate the forbidden longing of a people for liberation. While politicians shuffle from one foot to another, we create on rectangles of paper, a place where the Palestinian flag flies freely. We prefigure in the realm of the imagination, the end of the bloody journey while we honor the suffering that will be necessary to bridge the distance between imagination and reality.